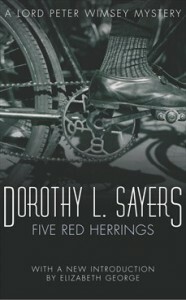 The Five Red Herrings started off strong and I loved the setting and some of the scenes - like Bunter being a few steps ahead of Lord Peter, retelling his adventures in the fashion of The Castle of Otranto, and then caring for Lord Peter by having the Arnica oinment at the ready for Lord Peter's bruises. However, ... for most of the book, I wished Sayers had spared us the details of doggedly chasing down every single train connection and what is more every single - it seemed - damned bicycle in the country only to find out that it was not the bicycle in question. Not one of my favourite Wimseys.